This tale unfortunately does not involve me walking through the wholesale flower district and discovering a strange and interesting plant after a total eclipse of the sun. I'm sure most people have heard of a Venus Flytrap, but not everyone knows we have our own local carnivorous plants. 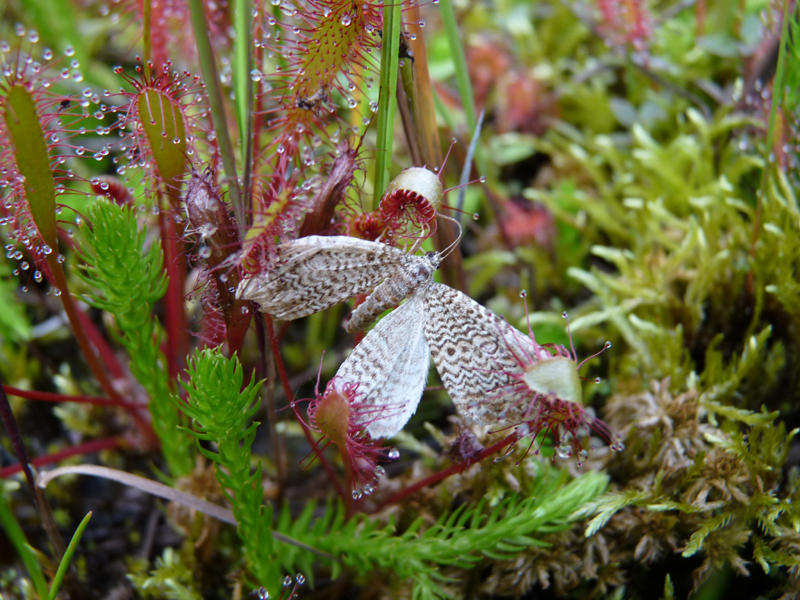 In fact, we have 11 species of carnivorous plant in British Columbia, which includes sundews, butterworts, bladderworts, and even a pitcher plant. My reference specifically pertains to the genus Drosera, which are collectively known as the sundews. Rather than try to describe a sundew, it's best to just see photos of the two common species in our province: Round-leaved Sundew (D. rotundifolia) and Great Sundew (D. anglica). The stalked glands tipped with sticky secretions on sundew leaves serve to attract and trap insects and, once captured, enzymes are released to digest the prey. The enzymes break down the insects into nutrients that can be absorbed by sessile glands on the sundew's leaf surface. 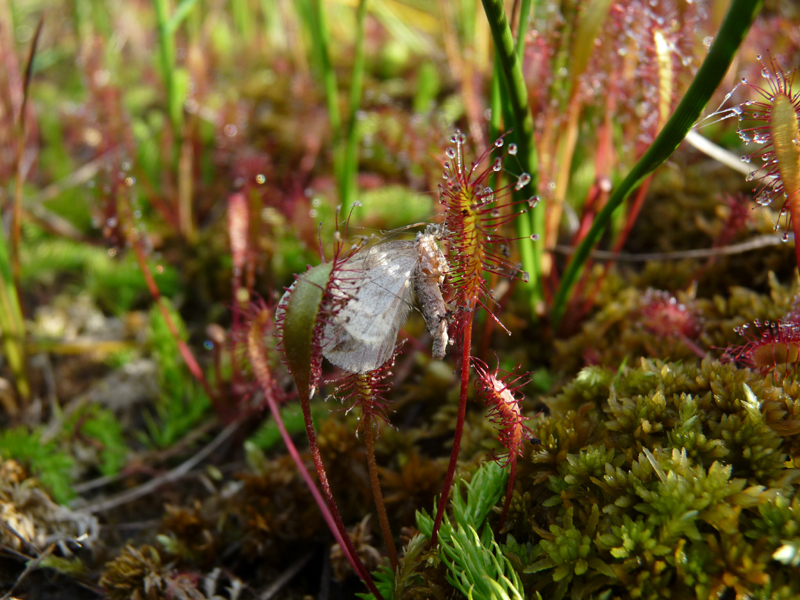 I have seen many sundews in the last few years, but I had never taken the time to look carefully through patches of them for large, captured prey items. While transiting north to Valemount from Kamloops, I had a specific destination in mind to stop and look around. Every time I drove by the location in previous summers, I thought "That looks interesting!" A couple weeks ago I was finally able to walk around and determine firsthand whether the location was indeed interesting - for the record, it was quite special from a botanical perspective. 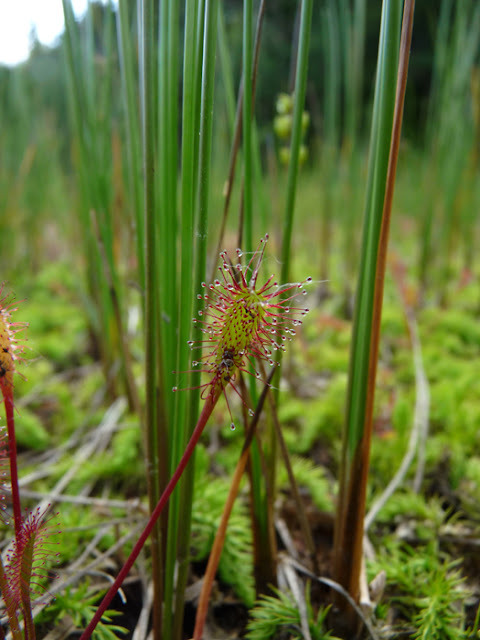 The area was dotted with both Round-leaved and Great Sundews and Bog Clubmoss (Lycopodiella inundata) popping up through an extensive mat of sphagnum moss. While wandering around the boggy habitat with my head down, I noticed a moth had been captured by one one of the Great Sundews! I was unaware how effective the adhesive glands of sundews could be in capturing insects. 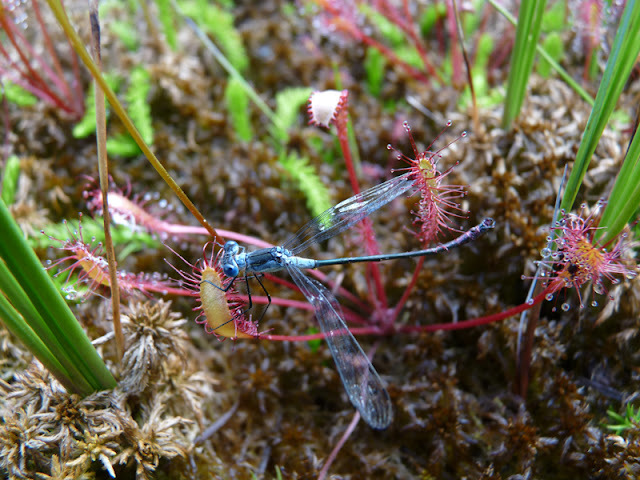 Shortly after seeing the trapped moth, a damselfly was found trapped by the sticky secretions of two sundew leaves! Next on the menu for the sundews was another moth. Jamie spotted the trapped moth and it appeared to still be struggling to extricate itself from the long, stalked glands. One look at this moth and it was clear its fate was sealed and it would soon be served an enzymatic cocktail. Another damselfly was captured by sundew leaves that appeared to be reaching up like hands to drag it down. 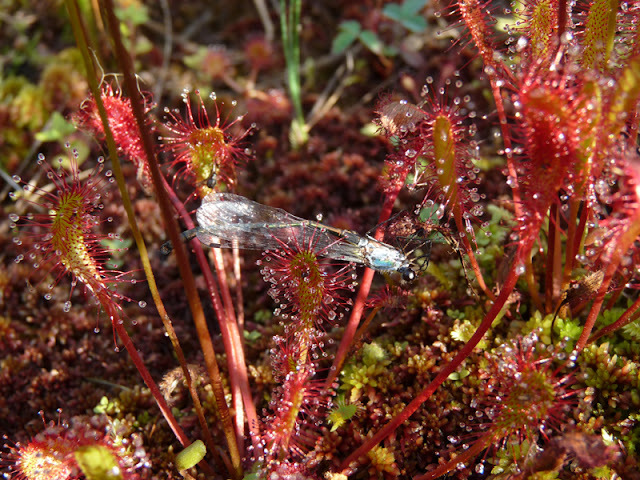 I now know that sundews have the capacity to trap insects as large as damselflies and moths. What is the limit of their effectiveness? Can they take down dragonflies or butterflies? 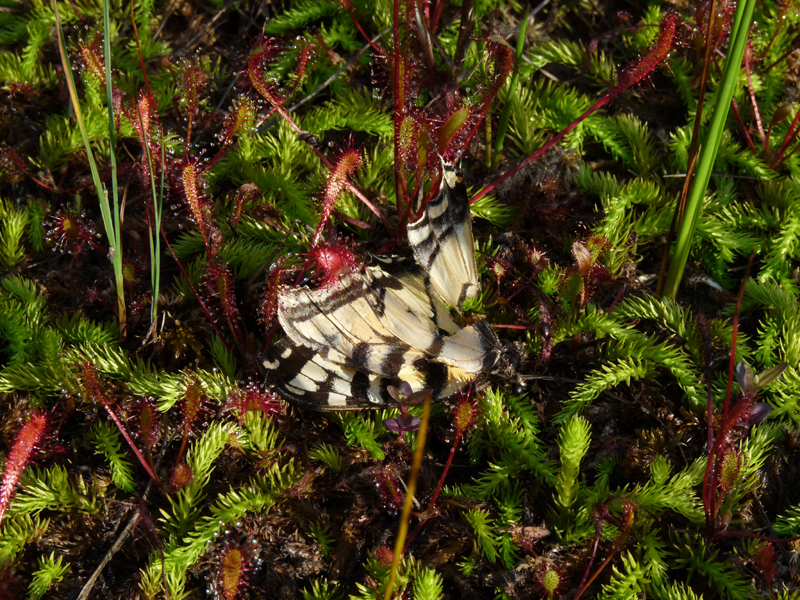 I had to wonder what happened to a Canadian Tiger Swallowtail (Papilio canadensis) that was found dead in the bog. Did a dragonfly or bird kill it or did it happen to land in with the sundews and get stuck? You decide! Who killed this Canadian Tiger Swallowtail? I think it was Professor Plum in the observatory with the candlestick... or maybe it was indeed the sundews? These sundews are nowhere near as sinister as the Audrey 2 in the 80s version of Little Shop of Horrors, but its the best our local carnivorous plants have to offer. 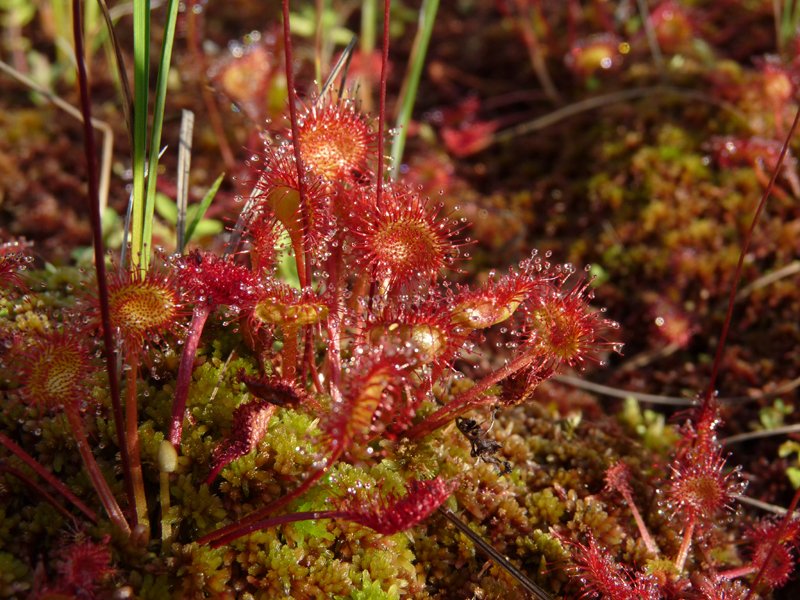 If you happen to find yourself wandering through a bog and notice sundews, take the time to inspect them and you'll be amazed at how effective they are for a passive predator.